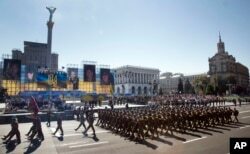 As thousands of troops marched Monday in Ukraine's capital, Kyiv, to mark the 24th anniversary of the country's independence from the former Soviet Union, President Petro Poroshenko said the next year would be one of struggle against Russia's efforts to undermine the nation. Speaking in the capital, where veterans of the Kyiv's ongoing campaign against pro-Russian separatists were cheered by throngs of civilians, Poroshenko accused Russia of sending more troops and weapons across the border. The Kremlin denies giving military support for pro-Russia rebels in Ukraine's east, despite mounting evidence. Unlike previous celebrations, this year's parade did not include heavy military hardware. "We can get through the [upcoming] 25th year of independence as if on brittle ice," said Poroshenko. But "we have to understand that the smallest careless step could be fatal." The campaign for independence, he said, could continue for decades. "The war for [Ukraine's] independence continues, and we can gain victory in it only through joint defensive efforts, diplomatic knowledge, political responsibility and iron self-control." Ukrainian army soldiers march on Khreshchatyk street during military parade on the occasion of Ukraine's Independence Day in the capital Kyiv, Ukraine, Monday, Aug. 24, 2015. The celebrations contrasted sharply with events in Ukraine's Crimea Peninsula, which was annexed by Moscow in 2014. The organization Human Rights in Ukraine said police detained two pro-Kyiv activists for laying flowers at the grave of revered 19th century Ukrainian poet Taras Shevchenko, who is widely seen as the father of modern Ukrainian language and literature. Earlier this month, Crimean police arrested two activists for taking pictures of themselves holding a Ukrainian flag near a monument to Soviet Union founder Vladimir Lenin. Ukraine's declaration of independence on August 24, 1991 — and referendum a few months later — heralded the breakup of the Soviet Union. But according to Dmitri Trenin, director of the Carnegie Moscow Center, it was only in the late '90s that the Kremlin elite and Russian people accepted the idea of Ukraine as an independent state. “To a lot of people in Ukraine, what's happening is a rebellion which is backed by Russia," he said. "In that sense, Poroshenko is fighting for ... complete independence from Russia. He says Russia's 2014 annexation of Crimea was a move the Kremlin had long planned to make if it found itself losing to Western influences in Ukraine. The popular uprising that led to the ouster of Russia-backed Ukrainian President Viktor Yanukovych was seen by the Kremlin as the final straw. Unrest in Ukraine's east began just weeks after the Kremlin seized Crimea, and Russian nationalists used the momentum to revive concepts such as "New Russia" and “Russian World” that question Ukraine's status as an independent nation. But even in areas still held by the Russia-backed rebels, where criticism of Kyiv is high, those movements have been largely abandoned from lack of support. Clashes between Ukrainian forces and Russia-backed rebels have killed more than 6,500 people since fighting erupted in April 2014. The leaders of France, Germany, and Ukraine met in Berlin Monday evening to discuss efforts to address a recent spike in the battles. President Poroshenko said they needed to ensure that observers with the Organization for Security and Cooperation (OSCE) in Europe have unimpeded access to the Russian border. Russia and the rebels currently limit OSCE access to just a fraction of the border. German Chancellor Angela Merkel emphasized the need to support a shaky February cease-fire deal reached in Minsk. "We are here to implement the Minsk deal, and not to call it into question," she said. The talks are expected to set the stage for a later four-way meeting that would include Russian President Vladimir Putin. The Ukrainian leader said the country will continue to expand its military in order to fend off attacks from Russia-backed rebels in Ukraine's Russian-speaking east. He said 50,000 Russian troops are gathered along the Ukraine-Russia border and another 9,000 are supporting pro-Russian rebels in separatist-controlled territories.